The Gentleman Crafter: Journal Fun and Ranger U! Thought I better come over and give everyone an update...LOL! First up, yes, kidney stone has passed. Thank God! Not my first and will certainly not be my last! But, it's over and done with! I hope! I feel so much better today! Just in time to jump on a plane in the morning.....Yahooo! Ranger U...I am packed and ready to go...I usually don't start packing until about two hours before I leave...but for some reason today, I had it all together and I'm ready....I think! I have countless notes all over the place to remind me to grab something on the way out the door so we will see! I'm also looking forward to making and meeting new friends. It's going to be awesome...Will keep you all informed when I get back to the hotel room each night...I think! LOL! First Page..Doodling...Never really did this before...I kinda remember doing this in school while listen to lectures, but never really got into it...It was so much fun...This is exactly what I will be doing on the plane to help me get my mind off the flight! LOL! By The Way, a suggestion from Dyan Reaveley! Good thinking my friend! Second Page....Trying to draw a face! Another first...So be nice! LOL! 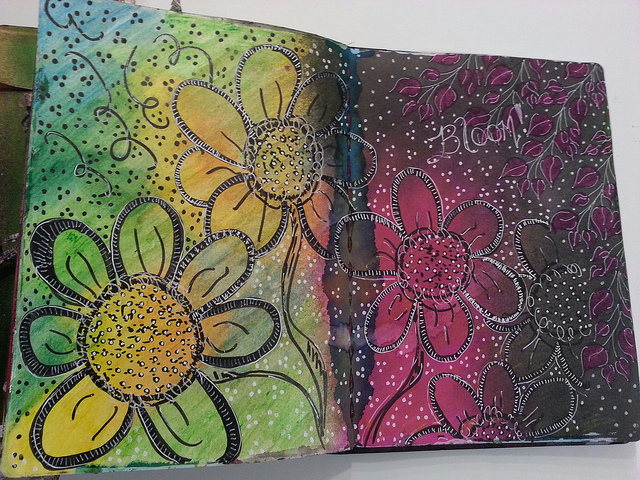 And Last ...some big old flowers using another first...water-soluble crayons...Wow these are very cool! Well, better get into bed...I've got the alarm set for 4 a.m. to catch my 6:15 a.m. flight! If you don't mind, please pray for calm NON-TURBULANT air! :) I would be grateful! Wow Jim is there anything you CAN'T do?? Bit of a creative genius I say. So excited (and jealous) that you are going to Ranger U!!! Like I said many months ago you will be Ranger's next Signature Designer. so thankful you're feeling better so you can enjoy your trip and classes! All 3 of your journal pages are amazing and gorgeous!! YOu never cease to amaze at how much talent you have. Glad you are feeling better Jim- just in time! Have fun and let us know how it's going... if you have time. Love all the journal pages, I can't draw a face if my life depended on it. Good job! Love the flowers too. I'm so glad your feeling better, have a fabulous time and learn lots so you can come back and enable us some more. I'll pray for a smooth flight, take care! Awesome!!! I love those big flowers! I hope you have a blast at Ranger U! Oh my...where to start? I'm so glad the stone has passed...know you are,too!!!!! Love the zen-doodles...great start! And the other journal pages...so much fun! As for the face...looks pretty darned good for your first one...not sure I believe it's your first...LOL!!! I wish mine looked as good!! Praying for a safe trip...and non-turbulent skies...for you. I hope your hotel internet allows you to share your weekend at Ranger U. Can't wait to see what you're going to learn. Above all...have fun!!! Glad you're feeling better too Jim! I can't draw a stick person, so I think you first attempt at a real person is pretty darn impressive. Take as many pictures and notes as possible to share, but mostly just have a fabulous time! Oh my goodness Jim... if you're "just learning" there's NO hope for me! I've been at this 4 - no! - almost 5 months now and my stuff doesn't look anywhere near as polished as yours! I'm fully impressed with your doodles and your journal pages on the whole ... not to mention your quick bounce back from the kidney stones. Glad that's done with for you! God bless your travels, your events and your return ... we look forward to updates when you can!! So glad you're feeling better, have a fantastic time!!! Jim, I am so jealous! My daughter and I were going to try to attend, but she is in her final semester of college, and a change of careers in the National Guard made it impossible for us to take this time off. So glad you are feeling better. And delighted that you are sharing this journey with us, your faithful followers! I love watching your growth as an artist! So glad you are feeling better. The journal pages are wonderful. And what a great idea to keep you distracted both while not feeling well and on the flight. Have a blast at Ranger U. Praying for clear sky and a smoooooth flight. Hugs! Glad you're better and ready for Ranger U - have a blast... it sounds such fun! 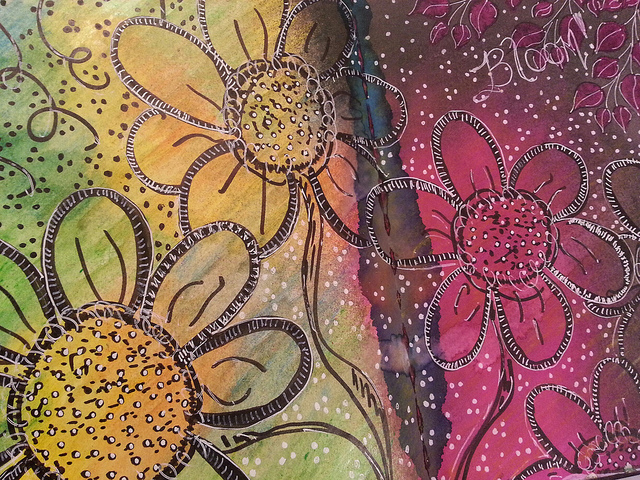 Love your journal pages, all of them.. but especially those big blooms!! Oh my word- a kidney stone. The man who does my paving jobs (every few years we have to have them relaid- due to very poor soil),had two before I knew him, and had just had one last time he did a job for us.His was due to not drinking enough water.He worked hard,and needed to drink far more than he did.When he did drink, it was only soft drink ( coke etc. ), and iced coffee. Please tell us this isn't what you do? It is excruciating pain from what he told me.You must be feeling very tired at the moment. Please take better care of yourself.As you age, your body needs more care. So glad you are feeling better... those stones are no joke ( just the mention brings back memories of mine), have had only one and hope never to have another one!! Lucky you ... Ranger U ... Oh I dream of going one day !! Your projects look like so much fun... is there anything you cannot do ?? Sorry to hear about your kidney stone :( - but glad that it's gone in time for Ranger U. Your journal pages are fabulous - are you sure that's your first face?! I love the big colourful blooms too. Have a blast at Ranger and we'll be glued to your blog to find out all about it! Hi Jim, I love all three journal pages. Glad the doodling helped with the pain & that your kidney stone has now passed. 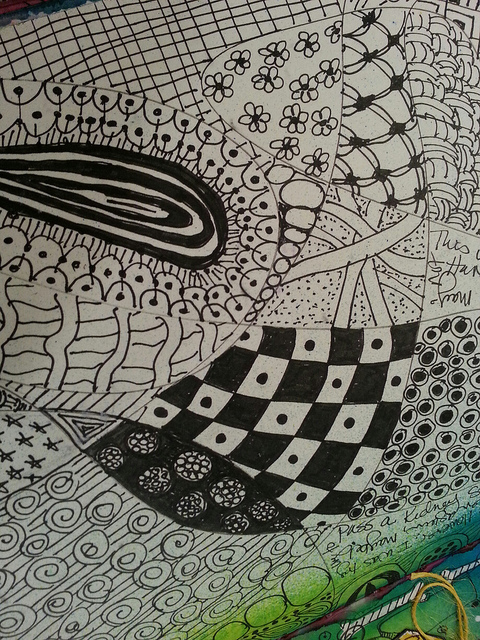 In the UK we refer to this art form as Zentangle, when you fill in areas like this = much more posh! Looking forward to hearing all about Ranger U.
you are amazing!! like totally true. have a blast at Ranger U and i have a prayer out there for you for no turbulence!! AMAZING! That's all I can say about your "first attempts"!!! I started doing Zentangle a month ago & found it extremely relaxing - helped take away the stress of taking a 2 hour test. You are a true artist! Can't wait to hear about RangerU & seeing pics! Have a wonderful time!!! **PS** What's the name of the crayons you used? Another very inspiring page. I was very artistic when I was young but when I got married and had a family they became my artwork and I quit devoting time to my drawing. I recently went surfing on the web and found your site. All I can say Jim is that your blog has inspired me to break out the canvases and paints and start that part of my life back up. Thanks for the push if you have a moment I would be honored if you would stop by and check out my blog and let me know what you think. I had no idea you were passing a stone...so sorry! Glad you are better! Have an amazing trip!!!! Great job on the zentangling Jim (did you know that's what you were doing???). My hubby has had several bouts with stones and all I can say is my sympathy. Glad it's over for you. You lucky dog attending Ranger U. That's my dream too but I'm not a "designer" or shop owner so.................Anyway enjoy the whole process and soak in the fun! Such lovely weather here in NYC, so I am sure it is great there for your flight and trip. Love your journal! Have a blast, and I look forward to hearing all about it and learning from you! 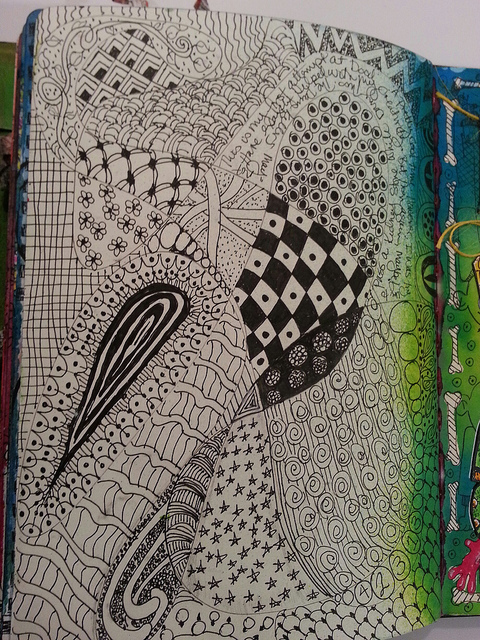 love your zentangle page...you go! of course i love the other pages as well....you done good!!! have fun at Ranger U and bring back lots of info to pass on to us! You continue to surprise me/us. Love your journal pages and the face is great for a first try. Ah yes, the ugly kidney stones. Many, many years ago I passed one the size of an almond. How? I was pregnant at the time and everything was larger than normal. When examined it was determined that it was all calcium pieces, collected into one stone. Many UTI since then, but thankfully medicine is so much better now. Take care and have a fabulous trip at Ranger U. Your jounal pages are great. I particularly like your face (fantastic first try)and water-soluble crayon pages. Your artistic talent is amazing! Have lots of fun at Ranger U! Wow JIM these are all great, imagine the possibilities if these are first try. Have fun at Ranger U. Thanks for letting us know what was going on with you Jim. I was worried when you didn't have your Tues Ustream. Sorry to hear you had another bout with stones. Hope you are better and will have a great time at Ranger U. Can't wait to hear all about it. Enjoy!!! Kidney stones are evil, and I'm certainly glad yours is gone - especially before your trip. I am lovin' these journal pages. 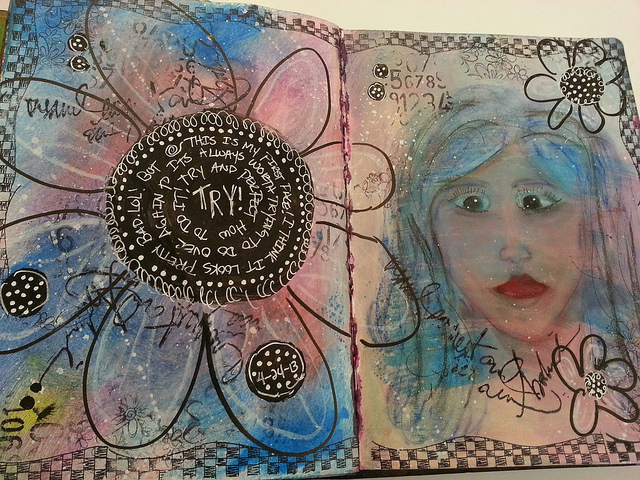 I attended my first 4 Journaling classes with Dyan earlier this month at the Scrapbooking Studio in Moline, IL. She + the things she taught were truly life changing for me. I think your first face drawing is wonderful, the the doodling delightful. Thanks so much for sharing! Delighted you came by! I so wanted to wish you a safe trip and a great time at Ranger U. You're probably getting there right about now. EXCITEMENT!!! Can't wait for you to get back with all the scoop. As a nurse, my eyebrows are raised a bit by 2 stones so close together. Good work, getting it out of the way in a timely fashion. Lol - pain meds and zentangling. Looking at your page, nothing held you back. All your pages are terrific! Travel safe. I think that face is nice!!!! You are so talented! How does a person get to go to Ranger U? That would be so amazing to go to. You are an amazing, talented person, hope you have a wonderful trip, enjoy, enjoy!!! So glad to hear that your kidney stone has passed. My father had those while I was growing up and I know they can be so painful. Have a blast at Ranger U! I know you will learn so much from the big names there. Ranger products can do so many fun things. Lastly, your pages are fantastic, I love your face! She kind of looks scared, did you draw this while on your pain meds? Teehee! If so, you did a fantastic job, specially for your first ever face! By now you should be safely ensconced in your room at Ranger U. I wonder, are the dorms there as ratty as mine was in college? Ha! Enjoy your stay and don't forget the pictures. As far as the journaling goes, just remember that many greats of literature and art created works while "under the influence". Not something I recommend as a whole but certainly not likely to impede your creativity. Can't wait to see what you share from Ranger U! Safe travels! Hey Jim, I just started keeping a couple different Art Journals and learning Zentangle! I have found some great books on Zentangle. It's addicting , ha! I love it! 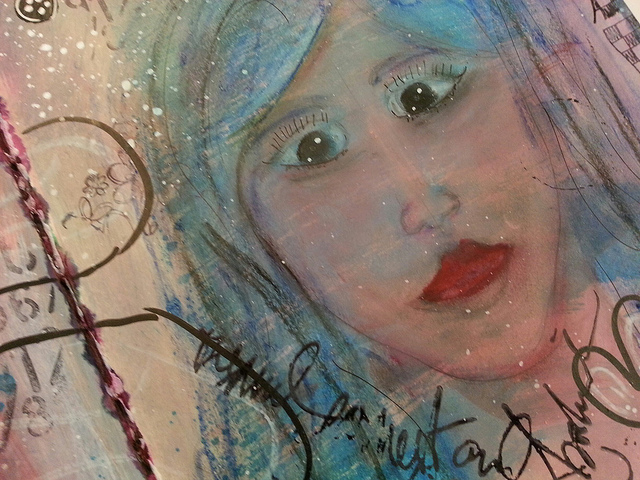 Your Art journal is awesome! I love your face. I haven't tried that yet, scared! Thank for sharing and I'm glad your feeling better! Whatever drugs you're on (I should have said medication)... I want some!!! Your journal is fantastic. The part that really amazed me is that you made your first big flowers look like they were filled with gel, and that there were things down below the flowers. Absolutely brilliant! Faces are hard at first but you just have to keep practicing and think about bone structure. Or just for the heck of it...just have fun! Love her lipstick. Where can I get that color? Safe journey and happy times be unto you.